As the makers of WHISKAS® we love cats for their independent spirits but understand they still need love and care. We know that cats are carnivores and crave animal protein just like big cats in the wild. That's why we have real chicken, salmon or tuna in all of our products, along with the highest level of protein compared to other Canadian brands. WHISKAS® products are the evolution of great tasting nutrition that empowers cat owners to encourage their cats’ wild sides. Available in 500g, 1kg, 2kg, 4kg, and 9.1kg bags. WHISKAS ® SEAFOOD SELECTIONS ® with Salmon is rated 4.4 out of 5 by 29. Rated 4 out of 5 by DANIELLESON_3401280706 from I checked out the prices while I was picking up our free bag, and it seemed that this brand was pretty average as far as pricing goes. My cats absolutely loved it, and I was impressed when I read the ingredients listed on the package. I would definitely buy this brand again, as well as recommend it to anyone else looking for a brand to try. 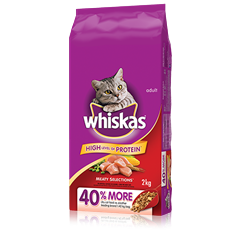 Rated 4 out of 5 by CHRISTINEDQC_3401266871 from My cat enjoys Whiskas as dry food, he ate it regularly as he does when he likes a certain food. I think the softer pieces were attractive to him as it reminds him of the treats we give him. I would definitely continue to give him this food and even recommended it to my friend who just got a new cat. Rated 5 out of 5 by SANDRAHAB_3401270557 from My cat found this food delicious to the point that I had to store it somewhere he couldn't find and access it or he would have had his head in the bag snacking all the time! 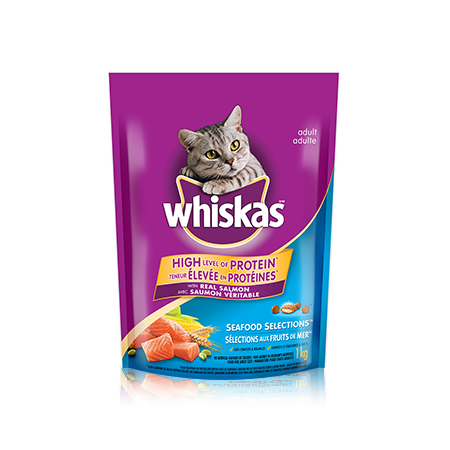 Rated 4 out of 5 by NATASHAPON_3401242757 from My cats really enjoyed the Whiskas seafood selections food. They preferred it over their usual Purina food. I will be purchasing this when they run out. 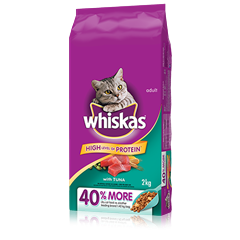 Rated 5 out of 5 by LORIONS_3401259419 from I have never fed Whiskas to our cats before but I'm always open to trying something new. Our cats seemed to really enjoy the sample and I would not hesitate to buy it again. CHICKEN BY-PRODUCT MEAL, GROUND YELLOW CORN, CORN GLUTEN MEAL, ANIMAL FAT (PRESERVED WITH BHA), SOYBEAN MEAL, WHEAT, NATURAL FLAVOUR, SALMON, WHEAT FLOUR, RICE, POTASSIUM CHLORIDE, SALT, VITAMINS (CHOLINE CHLORIDE, dl-ALPHA TOCOPHEROL ACETATE [SOURCE OF VITAMIN E], VITAMIN A ACETATE, NIACIN, VITAMIN B12 SUPPLEMENT, RIBOFLAVIN SUPPLEMENT [VITAMIN B2], THIAMINE MONONITRATE [VITAMIN B1], d-CALCIUM PANTOTHENATE, VITAMIN D3 SUPPLEMENT, BIOTIN, PYRIDOXINE HYDROCHLORIDE [VITAMIN B6], FOLIC ACID ), SALMON MEAL, TAURINE, dl-METHIONINE, SHRIMP MEAL, TRACE MINERALS (ZINC SULPHATE, COPPER SULPHATE, MANGANESE SULPHATE, POTASSIUM IODIDE), WHITEFISH MEAL, IRON OXIDE, BHA, BHT. WHISKAS® SEAFOOD SELECTIONS® with Salmon is formulated to meet the nutritional levels established by the AAFCO Cat Food Nutrient Profiles for adult maintenance.